Foldable and Removable The battery charger can be removed from solar panel, the slim lightweight battery charger can be carried anywhere (it can be also carried to the airplane).High Capacity10000mAh Solar Charger can fast charge iPhone 7 for 4+ times, an iPhone 6 for 4+ times, Galaxy S6 for 3+ times, iPad mini for 1.5 times. provide enough power for your phones. Dual USB Port and Quick Charging Quick charging current and charge 2 devices (such as iPhone and iPad) simultaneously. The charger will stop to charge your phone automatically after the phone was fully charged, protect your device from over-heating and over-charging. Bright LED flashlight Long press the ON/OFF button to turn on the LED flashlight. Press the button again switch flashlight between 3 modes(steady-SOS-strobe).Press ON/OFF button again to turn off the LED light. Charging methods4 recharge option can be choosed, not only can be recharged via sunlight and wall outlet, but also charged via strong lights and USB port, don't need worry you will out of power anymore! Best Outdoor Companion With a free hook, you can hang it on backpack or tent to charge via sunlight at outdoor. Suitable for a wide range of occasions like travel, road trips, hiking, camping, parties, BBQ and outdoor activities. Product SpecificationCapacity:10000mAh/37WhSolar power: 2.5W/500mASolar pannels size: 6.9 * 6.1 inch / 17.6 * 15.5 cm Battery: Li-polymer battery Input (Max): 5V 2.0AOutput (Max): USB 5V/2.1 A Dimension: 6.1*3*1 inch Power bank weight(without solar panels):182g / 0.4 lbTotaly weight(with solar panels): 298g / 0.66 lbPackage includes1 x 10,000mAh Solar Charger,1 x USB Charging Cable,1 x User Manual Attention:(1) The green pilot lamp on while charging via sunlight. If you shade the solar panels, it will turn off. (2) Due to the limitation of weather and environment, it maybe take long time to get full charged if only charged by sunlight(about 24-25 hours under full sunlight).Ordinarily recommend to charge by outlet, which is more fast to get full charged( 1A plug 10-12 hours, 2A plug7-8 hours ). (3) 4 blue LED pilot lights for battery level indication (25%, 50%, 75%, 100%) and power type indication( Green light flashing when charging via sunlight, blue light when charging via electricity). 10000mAh Solar Charger: It can fully charge your iPhone, Samsung for 4-5 times. Compatible with all the phone models, including iPhone 6 6s 7 8 7Plus, Samsung Galaxy S7 S6 / Edge / Plus, Android HTC, Sony, Nexus, HUAWEI, Xiao MI, etc. 2.1A Fast Charging: ADDTOP solar charger equipped with 2 Waterproof USB ports, which can fast charge an iPhone and an iPad(two device)simultaneously. 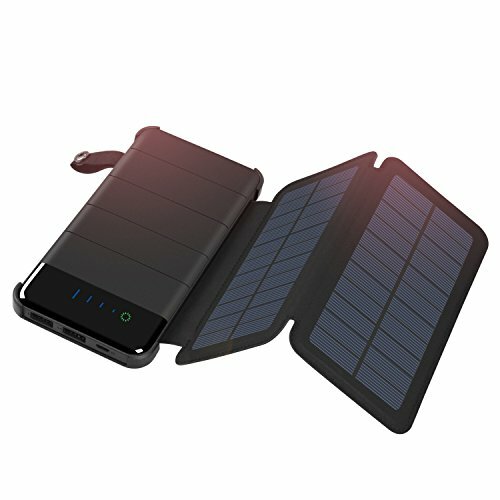 Detachable Solar Charger: The portable Power Bank Body can be easily removed from the solar panels. When the power bank is fully charged, you can remove it from the solar panels. Made of Durable ABS Material + Waterproof Wear-Resistant PU Shell. Built-in Ultra-Bright 9LED Flashlights, which supports 3 modes (Normal / SOS / Strobe) for your convenience and emergency use in dark. What's You Get: ADDTOP 10000mAh Solar Charger, USB Cable, User Manual. We provide 12 Months Warranty and Friendly Customer Service. Exquisite design let the solar power bank became a good gift choice.